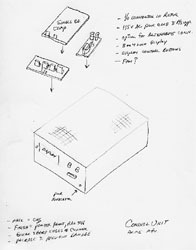 Concept to manufacturing ready drawings. 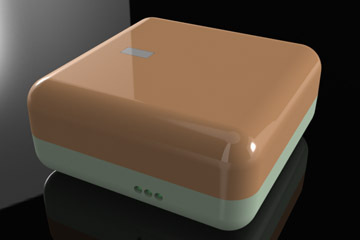 Taking a part or product from concept to manufacturing involves a number of steps. The required functionality of the product must be defined up front. The physical shape and feel (if that matters) are at least roughly defined. Environmental factors are considered - temperature, dampness, impact, vibration and shipping among others. 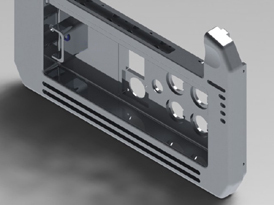 It helps to have the purchased components - displays, switches, feet, handles, connectors - specified as early as possible so openings, clearances, etc. can be worked out as the design progresses. Build it first in a good CAD system. 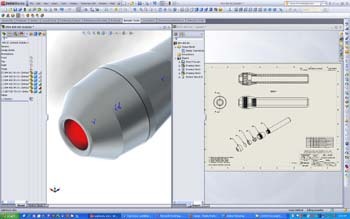 The latest version of SolidWorks® is our CAD system of choice. It is, in our opinion, the best tool around for designing parts and assemblies, creating accurate fabrication drawings, Bills of Material, etc.. Integrated tools facilitate checking component sizes and fits, check for interferences, tolerance build up and other issues before prototyping or manufacturing begins. Accurate part and assembly weights, center of gravity and other useful information is tracked while the models are being developed. 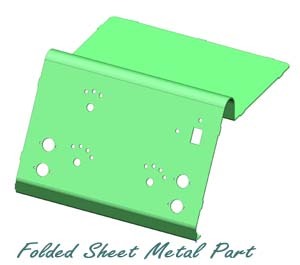 Experience working in precision sheet metal shops has given us an understanding of what can, and as importantly, can not, be formed out of metal. Edge proximity, punch vs. metal thickness, bend allowances and bend radii are examples of design parameters that affect part results and success. If you have existing sheet metal vendors that you prefer to work with, we can 'build-in' appropriate bend allowances for their tooling. Although there are standard formulae for calculating these numbers, we know that some vendors have proven out their own bend allowances, mostly for 90 degree bends, based on tooling and experience. Many vendors include some measure of time to program flat patterns in their part cost quotations. We can supply flat patterns to them, thus reducing your costs. Again, experience working in metal shops has provided a good understanding what it takes to turn and mill metal and plastics. We work with local machine shops, or your existing machinist, to avoid difficult to machine features and features requiring special tooling. Cutter run outs, deep small radii, drafted surfaces, small holes and material warpage are among the items that must be watched and controlled. Tolerancing of machined parts can be critical, so special attention is paid to running or interference fits and sliding surfaces. This is true of surface finish (roughness) also.